Chronicle Editorial Board March 16, 2019 Updated: March 16, 2019 5:13 p.m.
What they omit is the consensus against the policy that persists among experts and the public. 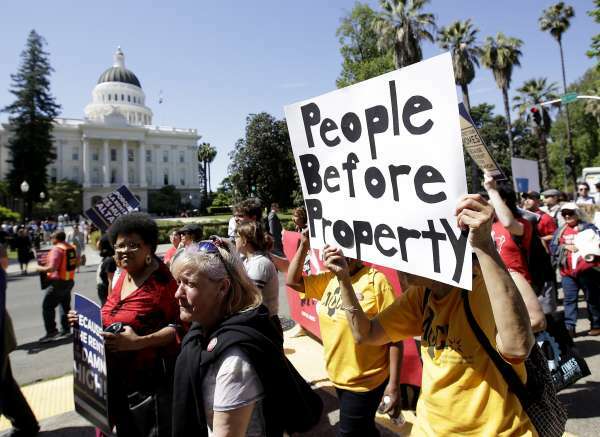 Last fall, despite the depredations of the housing shortage and its proverbial too-damn-high rents, Californians roundly rejected Proposition 10, a ballot measure that would have cleared the way for more rent control. Yes, those dastardly real estate interests outspent supporters of the initiative 3-to-1. But similarly lopsided campaign spending wasn’t enough to pass measures to expand property tax breaks, for example, or fund a grab bag of water projects. Moreover, rent control diminishes the supply and maintenance of rental housing, exacerbating the shortages that drive up rents. That’s why economists broadly reject the approach. (Sample response to a poll of economists asking whether rent control improves the quality and quantity of rental housing: “Next question: Does the sun revolve around the Earth?”) A Stanford study of San Francisco’s 1994 expansion of rent control to smaller multifamily buildings found that it saved affected renters nearly $3 billion through 2012 — and cost the city’s other tenants about as much. Meanwhile, landlords took rental units off the market en masse, reducing the supply by 15 percent. Under the Costa-Hawkins Act, California currently prohibits rent control for properties built since 1995 and freezes pre-existing rent-control ordinances; San Francisco’s policy, for example, can’t be extended to housing built since 1980. Legislation unveiled last week, AB36 by Assemblyman Richard Bloom, D-Santa Monica, would allow San Francisco and other cities, with some exceptions, to expand rent control to apartments and homes constructed as recently as a decade ago. Bloom’s bill doesn’t go as far as Prop. 10, which would have repealed Costa-Hawkins entirely, but it goes far enough to invite a dramatic and counterproductive expansion of rent control. It would also repeat the mistake of delegating more housing policy to the local governments that have largely acted to suppress residential development. A more moderate anti-gouging bill by Assemblyman David Chiu, the San Francisco Democrat who chairs the Housing Committee, has the potential to protect tenants from the most excessive rent hikes without harming supply. His measure, AB1482, would limit rent increases statewide to a percentage — as yet unspecified — above the rate of inflation. Another workable tenant protection, AB1481 by Assemblyman Rob Bonta, D-Alameda, would place limits on evictions without cause. Rapidly rising rents are among the most visible and destructive consequences of the housing shortage, contributing in the worst cases to homelessness, which is why stopping or slowing rent increases by fiat is an idea that won’t go away. The challenge for legislators is to protect beleaguered tenants from the most abusive price increases without further discouraging supply — and to remain focused above all on increasing supply. While residents need help staying in the homes California has, the only way out of the crisis is to build many more of them.